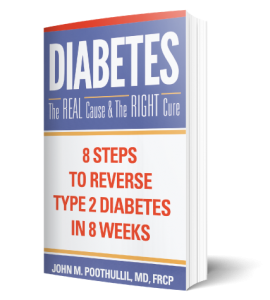 This week’s post is an excerpt from my book, Diabetes: The Real Cause & The Right Cure, taken from the chapter on exercise. I also included a short video I hope you will take a moment to watch. Lack of exercise is blamed as one of the causes for the increasing incidence of diabetes around the world, based on the reasoning that glucose not used to generate muscle energy is contributing to the elevation of blood sugar. On the surface, you would think this makes sense. When you exercise, your muscles send a message to the brain for additional fuel. The brain, in turn, sends a signal to the liver to release glucose not only to supply fuel to muscles, but also to brain cells. First, most people simply do not exercise enough to accomplish the goal of spending enough energy to make a significant difference. Exercising burns very few calories relative to one’s daily intake. A woman weighing 140 pounds may expend 270 calories by walking 3.5 miles in one hour, 390 calories by riding a bike for one hour and going a distance of 10 to 12 miles, or 430 calories by running 30 minutes at a speed of 7.5 mph. But if she is doing one of these forms of exercise only two or three times per week, all the while consuming 1800 or 2000 calories per day, she will hardly make a dent in depleting her fat cells. The same goes for men, although the numbers are slightly different. Add to this the fact that exercise itself usually makes people feel hungrier. You go out for a walk, a bike ride, or to the gym and you then return home and eat even more. Exercise often makes people crave sweets, or think they deserve a reward of an ice cream or a chocolate. 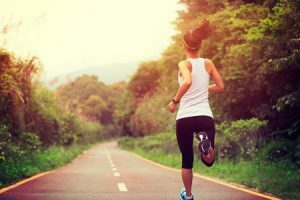 So if your strenuous exercise regimen is accompanied by increased calorie intake, you might even end up adding more sugar to your bloodstream. Exercise is not the most dependable tool for losing weight. While it is important to condition your heart, lungs, and muscles, exercise has its limits, particularly as you grow older. The best way to maintain weight loss is by reducing your food intake. So what is exercise good for? I don’t advocate exercise as a tool for diabetes management because I believe exercise is neither necessary nor intended for blood sugar control. If exercise were necessary for blood sugar control, then we would all feel the urge to exercise after a sumptuous meal containing carbohydrate, just as we feel the urge to move when listening to music with a strong beat. Instead, most of us feel lethargic after a heavy meal. Conversely, one might assume that a person who is eating but not exercising should be more likely to develop diabetes compared to one who is younger and able to be more physically active, but not everyone does. For example, the incidence of diabetes is increasing in younger populations compared to senior citizens who typically slow down their physical activities. Don’t get me wrong: exercise will help you lower your blood sugar level because active muscle fibers consume glucose without the presence of insulin (whereas inactive muscle fibers need the presence of insulin to begin allowing the entry of glucose). So it is worth-while to exercise to warm up your muscles, which triggers them to consume glucose.